Spring flowers on the Arctic plain. Photo: Madhav Pai, Flickr.com CC. 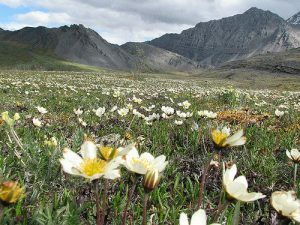 As a strong supporter of public lands, we believe that an attack on one such place is an attack on all the places we hold so dearly, and one extraordinary place is in need of your help today: The Arctic National Wildlife Refuge. That’s why we’re writing to you today, asking you to take a stand against efforts to drill for oil and gas on the Refuge’s Coastal Plain. On December 28, the Department of the Interior (DOI) initiated the second phase of the environmental review process for oil and gas leasing on the Coastal Plain of the Arctic Refuge, and they are now accepting public comments for 45 days on the proposed leasing program. The information gathered during this comment period will inform the environmental review of the proposed lease sale, and it is essential that we build a strong public record of opposition to any and all development, as these activities are inconsistent with the wild nature of this unique portion of America’s Arctic. In order to make our voice heard in this process, we submitted a comment to the Bureau of Land Management on why we believe this place should be protected for generations to come. We ask that you consider doing the same, by visiting the BLM’s project website here and clicking “comment on document. no later than February 11th. I am writing to express my opposition to any and all oil and gas development on the Coastal Plain of the Arctic National Wildlife Refuge. As the biological heart of the Refuge, the Coastal Plain is home to a wide diversity of species and an array of flora and fauna. It is highly sensitive, and is no place for drilling. Specifically, I am concerned about the impacts that drilling will have on the Porcupine Caribou Herd, which relies on the Coastal Plain as its birthing and nursing grounds. I am also concerned about the impacts that further drilling and development will have in exacerbating climate change. The Arctic is already experiencing warming at twice the rate of the rest of the United States, and moving ahead with further development seems short sighted. Public lands like the Arctic Refuge are important places for Americans and individuals from around the world to enjoy and explore, and these places should be protected for both current and future generations. We know that we want places like the Arctic Refuge to be protected for future generations to enjoy, and appreciate your consideration in standing up for this wild place. Bella is the Administrative & Development Director at the Northcoast Environmental Center. INVEST IN THE FUTURE, SUPPORT US! Your support helps us bring you important environmental news, sponsor cleanup and restoration events, advocate for important ecological legislation, and more! BECOME AN NEC MEMBER OR DONATE TODAY! Get alerts for upcoming events, action items and other news right in your inbox. The mission of the Northcoast Environmental Center is to promote understanding of the relations between people and the biosphere and to conserve, protect, and celebrate terrestrial, aquatic, and marine ecosystems of northern California and southern Oregon.